The Miller Syncrowave® 210 TIG/MIG Complete comes standard with expanded AC frequency while TIG welding AND the Spoolmate™ 150 spoolgun for MIG welding with both 4000 series and 5000 series aluminum MIG welding wire. 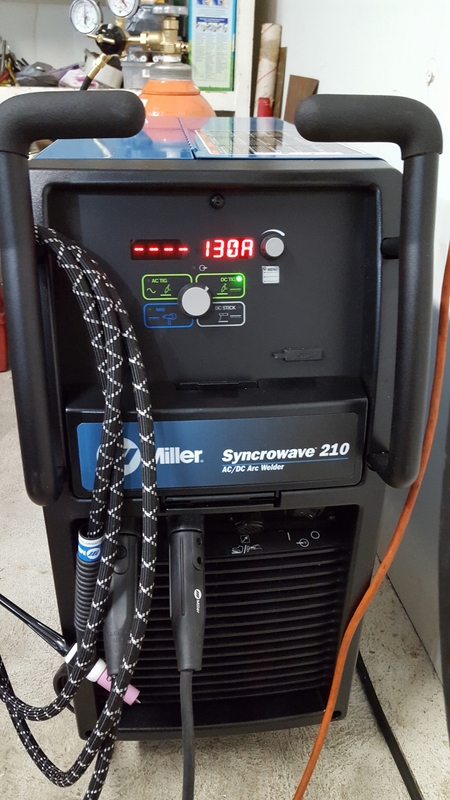 The Syncrowave's inverter technology allows for Constant Current (CC) welding output for AC/DC TIG, Pulsed TIG and stick welding AND Constant Voltage (CV) welding output for MIG welding with the Spoolmate 150 spool gun. Miller's Auto-Line power management system allows the Syncrowave 210 to operate on either 115 Volt or 230 Volt single-phase input power. 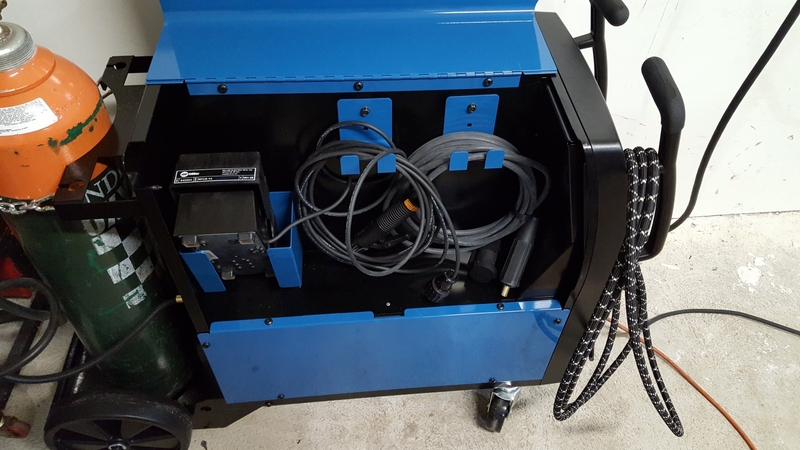 The 210 is capable of 210 amps of AC/DC TIG welding power using 230 Volt input and up to 150 amps of MIG welding output using the supplied Spoolmate 150 spool gun. 2. Select Process: AC TIG, DC TIG, DC Stick or MIG. 3. 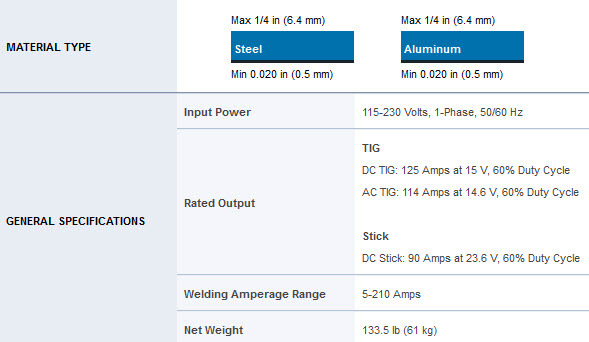 Set amperage based on material thickness. Then weld! It is easy as 1,2,3. Pro-Set™ feature (professional settings) eliminates the guesswork when setting weld parameters. Use Pro-Set when you want the speed, convenience and confidence of pre-set controls. Simply select the feature and adjust until Pro-Set appears on the display. Squarewave output with AC balance control features adjustable oxide cleaning which is essential for creating the highest quality aluminum welds. Pulse control enhances weld bead and puddle control for improved appearance and quality. Use it to reduce burn through, coordinate the addition of filler material, and reduce the warping effects of distortion by reducing the average heat input. Fan-On-Demand™ improves power efficiency and reduces noise and maintenance by decreasing the amount of airborne contaminants pulled though the machine. AUTO-LINE™ Allows 115 V and 230 V input voltage hookups. Upgradeable and expandable. Front panel memory card data port provides the ability to easily upgrade software and expand product features. Visit MillerWelds.com/TIGSoftware for the latest software upgrades and expansions. Auto-Postflow protects the weld end zone and electrode by optimizing postflow time based on welding amperage for adequate shielding every time without waste and no need for adjustment. Low power draw. Inverter-based power source provides full welding output from 230 V while drawing less than 30 amps. High frequency for non-contact arc starting. Eliminates tungsten and material contamination. Spoolmate™ 150 spoolgun provides up to 150 amps of MIG welding output and is capable of MIG welding with both 4043 and 5356 aluminum welding wires. PLUS get a $300 Build With Blue™ Cash Rebate from Miller® with the purchase of a Syncrowave® 210 TIG welder AND get up to an additional $200 Cash Rebate when you purchase qualifying Miller® or Hobart® branded accessories (excludes welders and plasma cutters). Download Build With Blue™ Rebate Submission Instructions HERE. All rebate forms MUST be submitted electronically to Miller no later than July 15, 2019. Offer expires 6/30/19. Is this machine air cooled or does it have a coolant reservoir? What size breaker would I need to use on the 110 and 220 inputs? 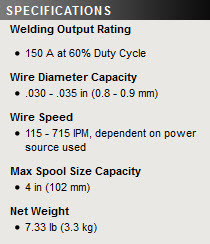 Miller Syncrowave 210 TIG/MIG Complete 951684 would require a 20 amp breaker on 115v and a 30 amp breaker on 230v. I'm considering buying this machine for my home based fabrication shop. It meets all my needs except that I'm not sure if I could hook up my miller wire feeder to it instead of a spool gun? Miller Syncrowave 210 TIG/MIG Complete 951684 will not adapt to a Miller wire feeder. The only mig option for this would be the Spoolmate 150 MIG spool gun. I have 2 Syncrowave 350's but need a smaller one that is more portable. In my opinion the 12.5' torch is useless unless using as a table only machine. In building race cars or street rods I have to have the 20 footer. This torch is not listed in the accessories. 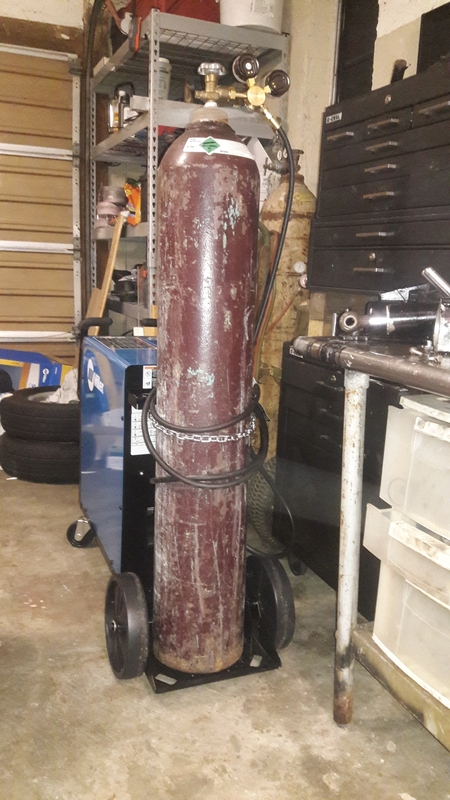 Which air cooled torch would work for this machine? The foot control is not ideal for what we do so which thumb control works with this unit? Do you have to use the spool gun for steel or does it have a separate wire feed from a reel? 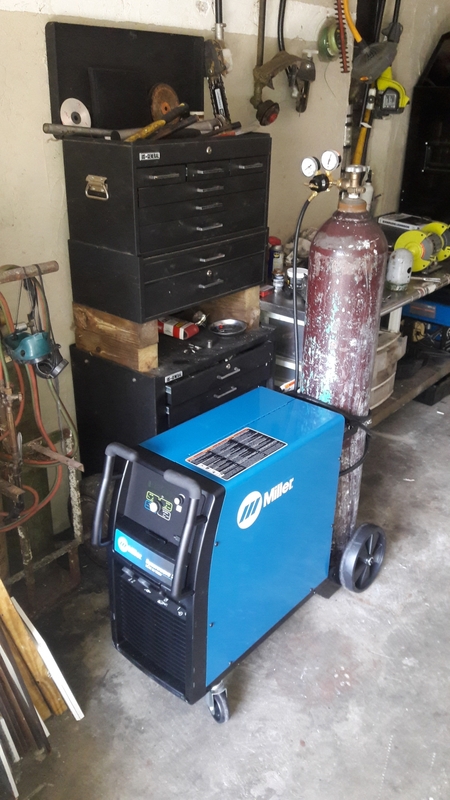 Miller Syncrowave 210 TIG/MIG Complete 951684, the Miller Spoolmate 150 can feed both mild steel and aluminum. The spoolgun provides the only mig feature on this machine. Can I add the spoolmatic 15a or 30a spoolgun to the synchrowave 210? I have 220/50 amp outlet in my garage is that enough amp service at 220v? Will the MIG gun handle steel as well as aluminium.. Yes, the Miller Spoolmate 150 can feed both mild steel and aluminum. Is it difficult or even possible to add a water cooler to the 210? Does the expansion software come pre loaded on the machine from the factory or on three separate sd cards? Miller advises that any Syncrowave 210 manufactured after October of 2016 will have the expansion software pre-downloaded upon arrival. Any updates after your original purchase can be downloaded onto the machine from the Miller Welds website. Which cart should i get for the Syncrowave 210? 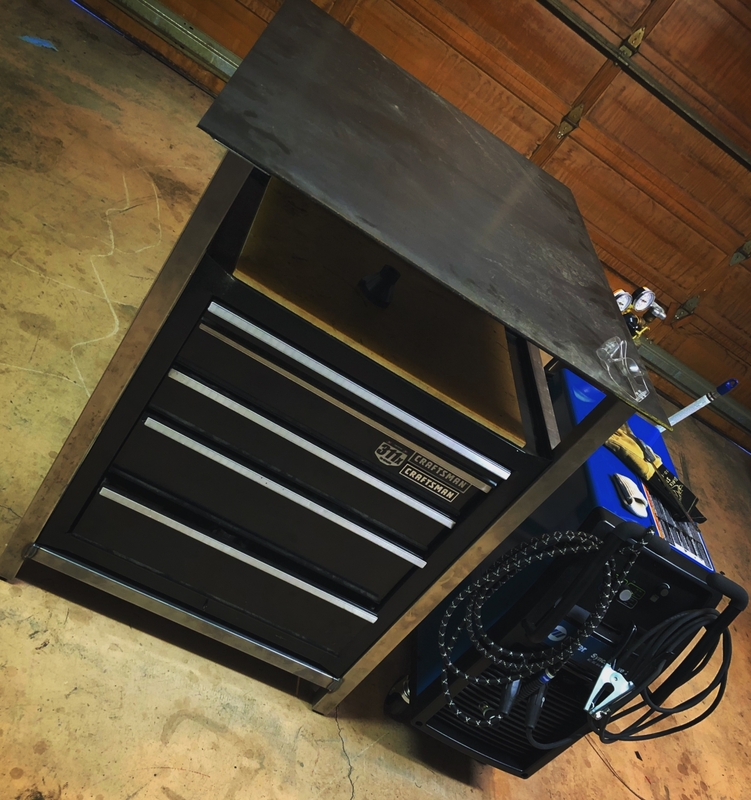 The Miller Syncrowave 210 TIG/MIG Complete 951684 comes with a factory-installed running gear with EZ-Change™ Low Cylinder Rack standard so you wouldn't need to purchase a separate cart. Does the tig come with tungsten rods? What consumables comes with the Syncrowave 210? This is going to be a gift. 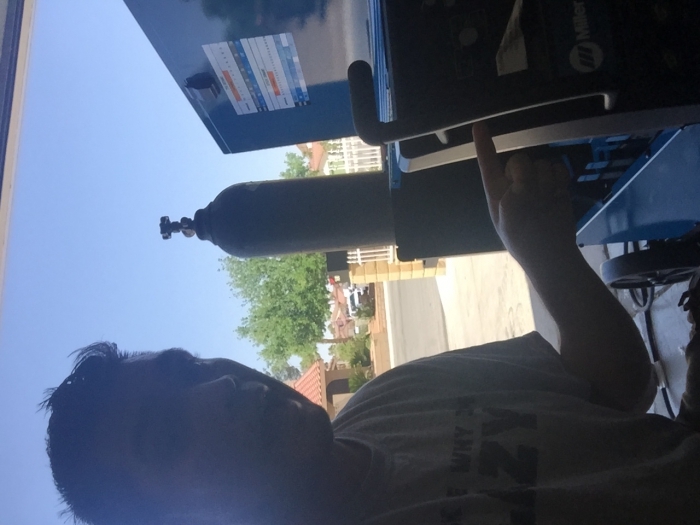 Hello, You all have a great deal with this machine and I was wondering how much it would cost to ship it to Mililani Hawaii 96789. In order to find out the shipping charges to Hawaii you would have to add the item to your shopping cart and follow the checkout instructions. Once you reach the section where you would enter your billing and shipping information, simply enter your shipping zip code and choose 2 Day Air as your shipping method and then hit "apply". The shipping charges and overall total will come up on the right hand side of the screen. The Syncrowave's inverter technology allows for Constant Current (CC) welding output for AC/DC TIG, Pulsed TIG and stick welding AND Constant Voltage (CV) welding output for MIG welding with the Spoolmate 150 spool gun. Is this correct? Does the 210 provide CC output for TIG and Stick and CV output for Mig? I looked on Miller's site and could not verify. I live in Virginia and am looking at possibly purchasing this unit. From what I understand the shipping is free, is that correct? Also is there any sale tax that is charged on the sale? With the Miller Syncrowave 210 can you TIG Aluminum and Stainless with just the TIG holder and not use the Spool Gun? Miller Syncrowave 210 TIG/MIG Complete 951684 can tig steel, stainless and aluminum. Do all three syncrowave 210 packages come with the same software expansion upgrades? All of the Miller Syncrowave packages come with the same software expansion upgrades. I see all three of the syncrowave 210 options are the same price. is there any difference between them besides this one comes with a better spoolgun. Is there any comprimise? Your are correct.. The three Syncrowave 210 packages are the same price.Miller is offering the free spoolgun packages for the same price as the base model for a limited time . (This program may extend to the end of the year).As you pointed out the only between the packages is the Miller Syncrowave 210 TIG/MIG Complete 951684 package comes with the Spoolmate 150.,the Miller Syncrowave 210 TIG/MIG Complete 951616 comes with the Spoolmate 100 and the Miller Syncrowave 210 TIG Welder 907596 base model does not come with a spoolgun. Not many customers are opting for the base model package. Does it only use the spool gun for mig or can you use regular mig torch as well? We are not a Lincoln distributor so we are not familiar with all of the capabilities of the Square Wave Tig 200. Basically the Miller Syncrowave 210 TIG/MIG Complete 951684 and the Square Wave Tig 200 are very close in their capabilities.Both are AC DC tig/ stick welders. The Syncrowave has a max welding output of 210 amps while the Squarewave is max rated at 200 amps.Both have advanced features of AC frequency,AC balance, and Pulse. Both machines are multi voltage and can run on 120 volt or 220 volt. The Syncrowave is capable of running a mig spoolgun. The Squarewave does not have mig capability. The Syncrowave weighs approx 135 lbs and is mounted on wheels. The Squarewave weighs 46 lbs and is more portable. Either one would be good hobbyist/light industrial machine. Is the sd port standard? And does it come with the stick lead? Miller Syncrowave 210 TIG/MIG Complete 951684 comes with the SD port as standard equipment. It also comes with the stick lead standard. very fast, unlike the Hobart that hardly balled it all. I can't find any adjustments for up & down slope. 2nd welder I've purchased from Cyberweld & 100% satisfied. Consbutton/dials too small and too close together. wish more of the adjustable settings had their own controls instead of having to go into menus to access. I'm not used to using a spool gun. would be nice if there was a external wire feeder attachment. little bulky for tight locations or crazy positions. wish there was more on-cart storage space. Have only had for a short while. 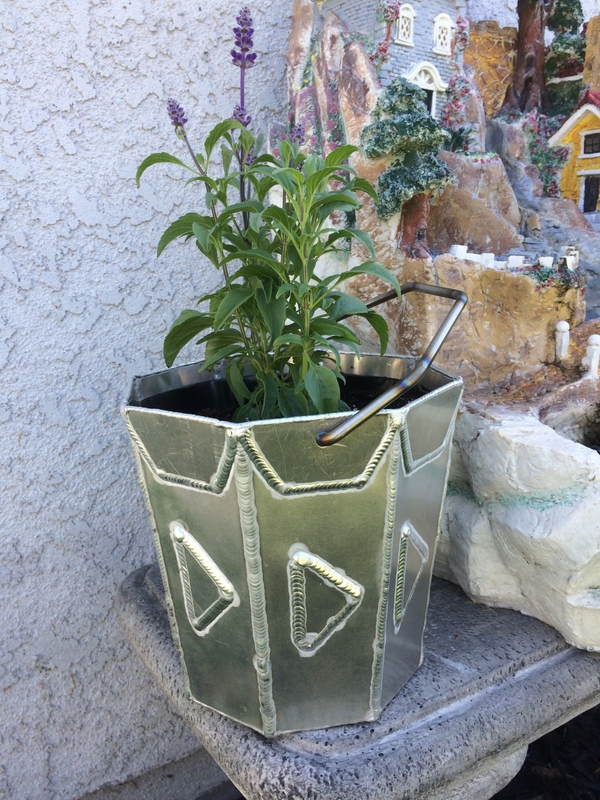 During this time I have had the opportunity to weld mild steel on several occasions. With the program for thin metal, I have seen very little warping due to the excess heat. I have to recommend highly Cyberweld for the fast shipping and no hassle purchase. I've had my syncrowave 210 for 3 months now still getting to know the machine but it performs very well. I've only used it for tig so far. Private shipping company was used to deliver the machine.. took 6 days from time of order. Cyberwelds pricing on machines was unbeatable, I shopped around for a few weeks comparing the syncrowave with Lincoln's multiprocess machines and miller won me over. I even asked my local welding supply store if they could match the price but they told me no. 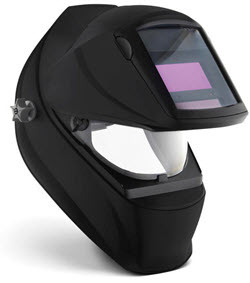 The purchase of the machine also came with a free digital elite hood, and a $200 cash rebate. ProsAble to mig, tig ac/dc and stick weld. Has storage compartment on side and below control panel for tig consumables. Came on it's own rolling cart. ConsTig torch gets hot quickly. I haven't used the machine much yet, but so far so good, great quality and performance. This is the second one I have purchased. The first was for the shop at my previous golf course maintenance facility. This one I purchased for my home shop. From fabrication to repairs Aluminum to Stainless steel it performs at top level. Great machine to teach someone new to welding. All good in my opinion. Purchased the Syncrowave 210 to replace a 250, which is a fantastic machine, but takes up lots of space. Originally planned to buy a Dynasty 210DX but couldn't justify the price. After surveying the market, and trying out other brands, took another look at the 210. Does all I need and has features that 250 doesn't, such as pulse and variable AC frequency. The dual voltage plug is great, it comes with all the accessories, and is very quiet. Welding performance right up with the Dynasty 350 that I learned on. 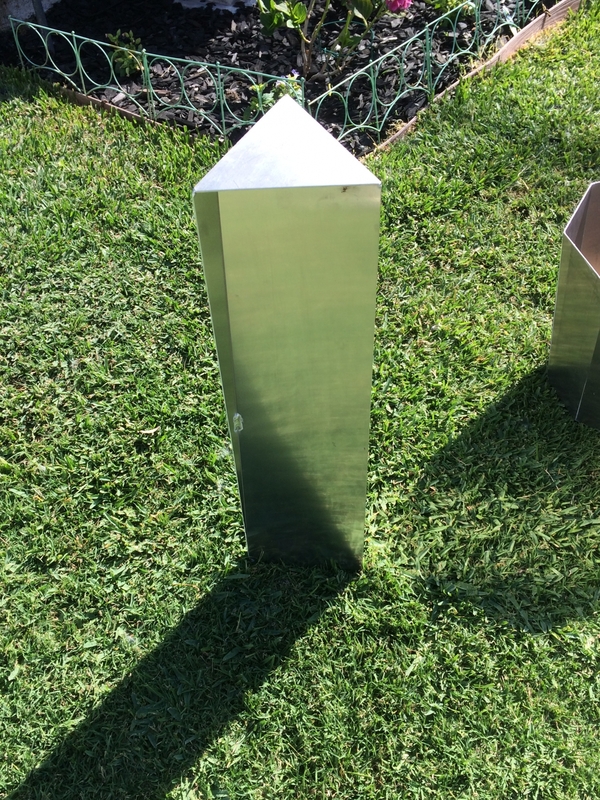 Mainly use to weld 1/16" aluminum "art" projects. I did switch out the torch for a CK9 and connected the two cables with a splice kit from Weld Tec. ProsVariable AC frequency CV setting for spool gun Big Miller foot pedal Fan on demand, only runs while welding. Pulse Built in cylinder cart Dual voltage - 110/220 Great service from Cyberweld, they are the best! ConsMain control knob is too small, should be the same as the one used to select process. Would also like the AC balance to go down to 50%, lowest is 60% Also bummed that I missed out on the $300 Miller rebate. I purchased last year when the rebate was $200. Very nice welder, put it to work right away! Buying experience was painless, welder was delivered on time as promised. Will definitely be shopping with them again. The Syncrowave 210 is a great all around machine. I've been using the Syncrowave 350 LX at my work for several years and I'm proud to own a 210 for home use. Upgrade-able and performs with the best of machines out there. Customer service and the freight company that delivered were very respectful and quick to address anything that I had questions about. I will buy from Cyberweld in the future! ProsVersatile and compact. Can be upgraded via SD slot on the front of the machine. Will handle every weld process you need. ConsHaven't found an issue yet! Limited use thus far but very easy to adjust and change settings. The spool gun and mask where an added bonus and both have been working excellently. I'd say it's an excellent beginners tool that will ultimately promote the user's skills to progress. I already had the 220v ran for my previous buzz box so all i needed was an outlet which was easy to change over. I received my 134 lb. machine in 2 days after ordering with free shipping. I can't say enough good things about this company. They are my go-to company for all my welding needs. ProsFast free shipping. Reduced prices with extras included. I am very pleased with this machine. I have used Syncrowave 250's in the past in the fab shops but this machine is perfect for my home use. The menu and setup are very easy to understand. Looking forward to many years use from this. I considered another machine because of price but I'm really glad this was my choice. The machine makes me a better welder. I own a smaller miller, and this just blows it away. Once you set it up, its real easy to use. Thanks Cyberweld for everything. Pros The auto set is very close to what I would want it to be. I use it on work that doesn't need that a great weld. ProsGreat flexibility of processes, and the extended software range software is helpful. Many nice options, lift arc, and pulsed tig just to name a couple. The torch is light and nimble, easy to manipulate. Conshaven't really found any except the external size is a bit large. 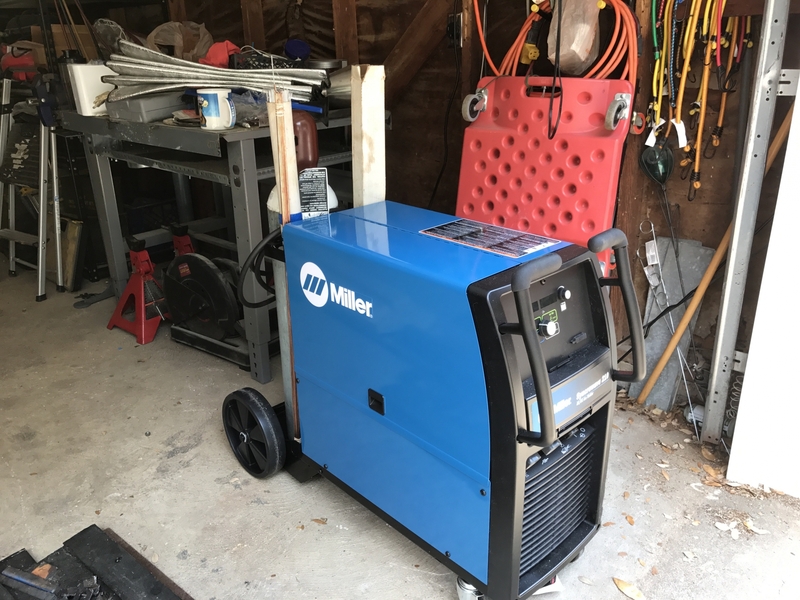 I have barely gotten to use this welder but it sure has the fantastic Miller product quality! I look forward to a lot of welding with this machine! ProsGreat quality and great value! Pretty decent welder, I believe plug into a 60 amp breaker would be ideal just to eliminate under power issues. All in all pretty decent product minus a couple draw backs. ProsMulti processes, pulse, Aluminum welding, ez use, moveablity, light weight, user friendly once you get use to it, upgrade-able, Price is pretty good, ready to go from day one, dependable, manageable size, dual power plugs, storage area, able to add water cooler, and the options. ConsUnder powered tig and stick wipes, doesn't come with dual bottle rack, no place for water cooler, doesn't come with any wire for spool gun to test that it works, not even a complimentary cover for your purchase, and more information for each process, kinda weak on a 110/120 plugin.. 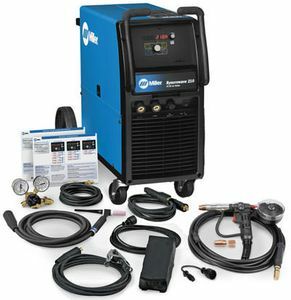 I'd give this new blue box a 5-star except I've never owned any other welder, so I can't compare it to anything. I learned to weld with an O/A outfit over the past year. Have owned my Syncrowave for a few months now, and was pleasantly surprised how easy it was to lay a TIG bead down. It's just a matter of swapping torch distance (O/A) with foot-pedal pressure (TIG). I've used the SpoolMate-150 a few times now for steel and it works about as I'd expect. I picked the Syncrowave to be my primary (hobby) TIG welder that can sometimes pretend to do MIG. Prosn00b friendly, easy setup, easy learning. Incredibly well built and designed machine. Even the stickers were applied straight-and-square! No details were spared. I expect this machine will still be serving my needs well into retirement. Money well spent. ConsWould have preferred a flow-meter instead of a flow-gauge. Would like more MIG-expandability, e.g. ability to connect a wire-spooler and dedicated MIG gun. I previously had an old Syncrowave 180... my first TIG machine. 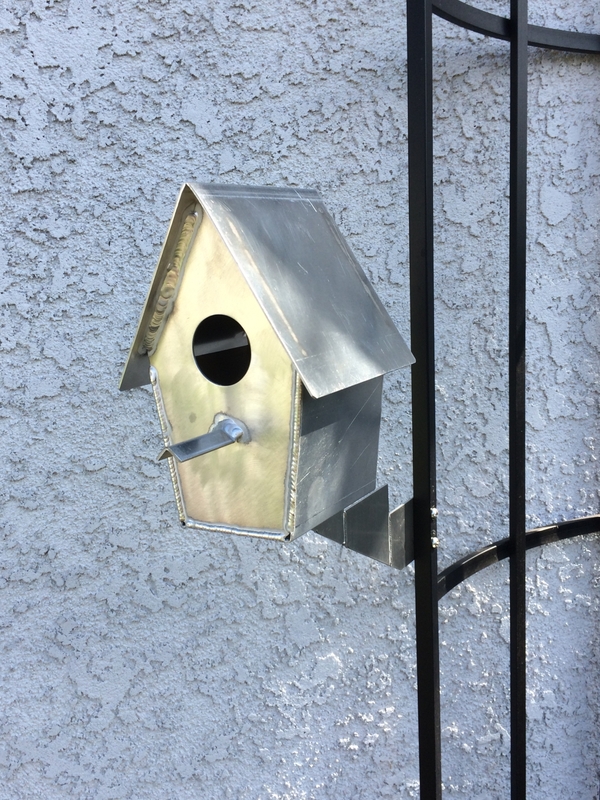 I could lay beads, steel was fairly easy, aluminum was a struggle. That machine had basically two settings; on/off, and amperage. The Syncrowave 210 is seriously in another league. Pulse control, frequency, cleaning, post flow... Not to mention spool gun capability! I LOVE this machine. Seriously, my wife is jealous of it because I spend so much time in the shop. ConsNone. I literally can't think of one thing bad about it.